CNN: Tell us about yourself and why we should feature you in CNN Light Years? Coleman: I am a polymer scientist and NASA Astronaut who had the privilege of living and working on the International Space Station for nearly six months. Although the station orbits only 240 miles above the Earth, it’s still a long, long way from home. I am married to glass artist Josh Simpson, and have a 12-year-old-son, Jamey, and a 29-year-old stepson, Josiah. Down here on Earth, we commute between Massachusetts and Texas, but commuting to low Earth orbit adds a whole dimension! The space station is a national laboratory, and during my time on board, there were nearly 150 experiments performed. It was like doing magic every day! None of our experiments can be done down here on Earth, and the results are often surprising. CNN: Can you share your favorite experiment from your work on the space station? Coleman: There are so many to choose from, I don’t know where to start. One of my favorites is Capillary Flow Experiment (CFE). I love it when I get to play an active part of making the experiments happen, and we all love CFE. Up in space, we get to see what liquids really want to do. It’s fascinating! Gravity is such a big force down here that it overwhelms many tinier forces, and makes them hard to measure. These tiny forces still have profound effects on every process that involves flow – from how blood courses through our veins to how anything is produced here on the ground involving flow through a pipe, including oil production! To name just a few examples, this research could help us design better groundwater transportation systems or improve in cooling for electronics. One day the CFE scientists assembled on the ground and I was in space. A voice from Earth said, “OK – shake it and try to make the bubble move suddenly, but don’t just shake the heck out of it.” From me in space: “What if I poke at it like this?” It turns out that several fluid physicists had flown in from all over the country to watch us do this experiment on orbit that day. We had done it the week before, and the results were apparently so exciting and hard to believe that the principal investigator had invited his colleagues to come and see it with their own eyes. Another good day on the space station! Space is also an excellent place to study how fires behave, which can help lead to cleaner, safer and more efficient fuels as well as less pollution. CNN: You spent 159 days in space. What was it like? Coleman: A day in space always starts with much more on my to-do list than a human could accomplish and never seems to end. There is just too much good work to be done! Every day, I wake up in my little cabin, the size of a phone booth, float out of my sleeping bag, and throw on clothes for the day. Pretty much the same clothes every day … six months – six pairs of pants!! The better news is that in space, we don’t have to put our pants on one leg at a time! I pop open the door of my cabin and give myself a gentle nudge to fly down to the lab. Every morning, I think the same thing: “I’m flying! I must still be in space!” It’s like waking up in the land of Peter Pan, and realizing that you live there, too! After tending to the basics in our tiny bathroom and rehydrating a quick bag of cereal with milk, it’s time for the Daily Planning Conference. All six of us gather and talk to the Mission Control Centers (MCCs) about the business of the day. That means Houston, Moscow and Munich for all of the European partners and Tsukuba, Japan, for experiments and systems in the Japanese module. Each of us will have already read the daily schedule that runs our lives on a minute-by-minute basis and we are tagging up with the folks on the ground to make sure that we don’t miss any important nuances to the day. On a typical day, I could work on five or six different experiments, ranging from medical research to fluid physics studies, do some maintenance activities and repairs and assess our supplies. Last but not least, I will be scheduled for an hour of resistive exercise and 30 minutes of cardio to maintain my bone and muscle strength. Just like here on Earth, I usually eat lunch "on the fly," hydrating or heating up soup and something that can be wrapped in a tortilla. A final conference at the end of the day to check in with the various MCCs, and we are off the clock! After eating dinner and maybe watching the news together, my crew mates and I usually go our separate ways. Believe it or not, the space station is so big that we can easily go the rest of the night without seeing each other! Despite the fact that all of us continue to work unofficially, evening is a special time on the space station. It is time to talk to family, look out of the windows of the Cupola, maybe play my flute for a while, send e-mail to friends and family and read up about the next day’s work before turning out the light. Typically we follow “London time” on the space station, so it is always a struggle to find the right time to connect with everyone and still get enough sleep! Still, somehow it all works. Somehow I wake up the next morning, open my cabin door, give myself a push and find that I’m still in the magical land of Peter Pan! CNN: What do astronauts eat in space and how do you maintain strong bones? Coleman: I don’t think any of us go to station for the food, but you would be amazed at how far space food has come along. We have about 200 different food items we can select from – everything from beef fajitas to shrimp cocktail, which is the most requested food item. We have learned a lot about food and nutrition by living in space. As astronauts living on the station, we make very good subjects for scientific studies about bone loss. Without countermeasures, we can lose bone and muscle at 10 times the rate of a 70-year-old woman on the ground who has osteoporosis. It is a big problem here on Earth and for us in space, too. Imagine what kind of shape we would be in after the long journey to Mars! We are doing a number of studies on the space station that are helping to unlock the secrets of how to maintain healthy bones and muscles, such as looking at our vitamin D intake, nutrition and exercise. It happens so fast up there that it is easy for us to measure by taking periodic blood and urine samples. It takes a long time to study the results, but scientists are already discovering great information. The good news – or maybe the bad news, is that exercise is here to stay! We exercise about 90 minutes a day on the space station, and the results are promising for retaining bone and muscle. CNN: How are the photos taken from space used? Coleman: Those photos don’t come close to showing you the true view from space! I like the fact that the pictures we take from space can really make a difference, both in terms of data for people on the ground and the significance of people getting to see what their planet looks like from space. During Expedition 26/27, and while our Japanese supply ship, Kounotori, was attached to the station, Japan was struck by a terrible tsunami. Our photographs of Japan served as important data for disaster relief efforts because at night, they showed how much of Japan’s power grid remained intact, and daytime photos gave further details about the extent of the damage. We also documented the tsunami damage in daylight. It was a difficult time for us on the station, knowing that our friends and colleagues were dealing with the loss of friends and family and damage to their control center. Being able to take those photos was helpful to all of us. We also made origami white cranes, which represented the spirit of hope and rebuilding to the Japanese people. CNN: Why does NASA continue to send human beings into space when automated technologies are improving? Coleman: Both humans and robots bring valuable and necessary skills to the exploration business, and we’ll need both in the foreseeable future. Some of the tough challenges that we face in our quest to explore our universe demand the flexibility and skills that only human beings bring. Humans can solve unexpected problems and situations that our automated robots and machines are not yet designed to address. 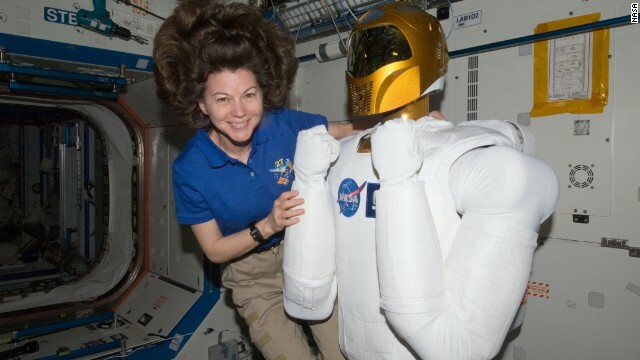 Our work up on the space station is paving the way for using robots for more and more tasks. Not only are we putting Robonaut through his paces up there, but our robotics controllers on the ground have been conducting Robotic Refueling Missions, which demonstrate the ability to operate a remote satellite refueling and repair facility. Satellites are essential for communication as we explore further, and the space station work brings us closer to being able to refuel and repair them while they are still up in orbit. We had three soccer ball-sized robots on board called SPHERES (Synchronized Position, Hold, Engage and Reorient Experimental Satellites). It was like something out of a sci-fi movie: robotic spheres flying around our space station in formation! They are mini-satellites that we can use to learn about how to program satellites in space to do more and more complex tasks such as mapping asteroids and Mars for exploration. CNN: How long does it take to get into space after launch? Coleman: Just 8 minutes and 30 seconds and then life as you know it is different. Everything is floating, anyone can fly, and experiments that can’t be done on the Earth are suddenly possible. CNN: What do you do during your down time in space? Coleman: Most of us end up working on experiments or maintenance in our spare time, but I also chose to focus on education projects for kids back here on Earth, and I played my flute. I’m just an amateur, but I took my own flute to the station, plus flutes for Ian Anderson of Jethro Tull, and Matt Molloy and Paddy Moloney of The Chieftains. On April 12, 2011, the 50th Anniversary of Yuri Gagaran’s first flight, Ian and I played the world’s first duet between Earth and space. I also play in a band down here on Earth called Bandella, with some other astronauts. These space station expeditions are tough on the band’s performance schedule … our lead singer/guitar player Chris Hadfield is up on the station right now! We still manage to play together thanks to the wonders of technology. Recently, we played “Moondance” with The Chieftains, and later this month we’ll be playing with Chris at EG 13, where entertainment and technology meet. CNN: What are you doing now? Coleman: Happily, I’m in line to fly again on the space station. However, that line is pretty long, so we’ll have to see what happens! In the meantime, I work in the Visiting Vehicles Branch of our Astronaut Office. My main job is to help our new commercial partners like SpaceX and Orbital Sciences understand what it is like to be onboard the space station when we capture one of their supply ships with the robotic arm. Currently, I am the lead for the first flight of the Orbital Science’s Cygnus mission, and I will be their CAPCOM, talking to the station crew from MCC on capture day! CNN: Do you think privately owned companies should be sending ships into space? Coleman: I will answer whole-heartedly, YES! CNN: Any final comments about living on the space station? Coleman: People are made to explore. You just can’t stop us. I feel privileged to have a role at "the pointy end" of exploration. I’m one of the few that gets to actually live in space and help us learn the things that we need before we proceed further out into the universe. By its very nature, space exploration knows no boundaries since we are exploring for all of mankind. With each space venture, we learn more and more – and not just about space, but about our own planet Earth and how to make our lives better – from medical benefits derived from space station research to improved robotics learned from our rovers on Mars. So, come explore with us! Coleman is on Facebook, Google+ and Twitter. As you age, your body may reabsorb calcium and phosphate from your bones instead of keeping these minerals in your bones. This makes your bones weaker. When this process reaches a certain stage, it is called osteoporosis. ;'*"
*fap*fap*fap*fap*fap*fap*fap*fap*fap*fap*fap*fap...uh uh uh uh uh uhhhhhhhhhhhhhhhhhhhhyeeeaaaaaahhhhhhhhh!!! Diarrhea is the polar opposite of puking, yet they frequently occur in tandem. Isn't science fun? What's up with that doll of hers? Does it run on batteries? ...whenever a robot in space photo shows up I must make sure i'm not in polite company because.....I may have a fit that goes.......I swing my arms all around and yell: "Danger! Danger! Danger Will Robinson!! Danger!!..." Then I calm down and am somewhat okay to reappear in public....LOL!! People that think we actually went to the moon are gay. As a middle school teacher and winner of Tracher of the Year TOTY award two years running I can attest that the United States never landed on the moon. You must also have received the JOTHY [Jerk Of TheYear] award. Of course United States never landed on the moon— space capsules and men landed on the moon. Okay, Emma, I'll play. What in the world does being "tracher" – I assume you meant "teacher" – of the year have to do with being in a position to say the moon landings were a hoax? I lived near Cape Canaveral in the late 60's. yes they shot rockets up into the air but these were carrying satellites into orbit – not people to the moon. The lunar space program was a fake. Every person with a scientific mind knows this. They were gay rocket ships. Gay ones. I love the way this article proves we never went to the moon. Now only sad uneducated losers believe the Apollo missions ever actually happened. Only sad uneducated LOSERS think it was faked. You guys have been proven wrong time and time again. Merely posting the dame moronic thing on the Internet will never, never, never make you right – like EVER!! The only thing that impresses me is that you actually took the time to do that picture – don't you have a life? Haven't you anything better to do? I've got better things to do – yet I wasted time replying to a troll !?. Serves me right for wasting time. And to all you twits over-using the word 'gay' – overusing ANY words just turns it into noise – despite it being actual hate speak. You guys must all be 11 years old or something – or maybe just the mental age of 11 year olds. @Matthew Me & my dog Astro have been reading your comments with great interest. You sound like you are out of this world. I like that in a person. I also like that troll 10's pic. That's really far out, you know like space. lol Oh, sorry, me and Astro had to chuckle at that one. Hope that comment wasn't too happy & gay for you. You know, I'm just a space kid at heart. Space tidings! POOOOOOOP. I wonder how they poop on space. That's for Mattew Black above. Being a scientist I feel the article above had far too many words to read without one getting a headache. Reading has been proven to cause headaches, especially in low light conditions. Since I'm already a scientist I choose not to read. Plus reading is gay. I'm using the term gay to mean happy and joyful btw. Being gay is fun. I'm gay gay gay as they come.